312. Sir Will. Parre to Cromwell. Notwithstanding that Mallorie of the forest of Whittilwod has been ordered to desist from making a sale to the King, Mr. Clerc and he have uttered already the same. And forasmuch as you had a warrant for payment of 100 oaks, which the King had of my nephew, which could not be obtained, be so good as let him have 100 trees out of the sale made by Clerc and Mallorie, with a warrant to them for the same. Horton, 11 March. Signed. P. 1. Add. : Of the King's Council. 313. William Popley to Cromwell. I send you four lamprey pies to help out Lent. They are baken after Cotswold fashion. Other dainties are not to be had in this country. When I was late at Bristol the mayor asked me whether I knew if you had given the recordership to Mr. Broke, hoping you would not give it without consent of the mayor and his brethren. Ciscetour, 11 March. Hol., p. 1. Add. : Of the Council. 314. John Basset to Lady Lisle. Has received her letters of the 3rd Feb., and with them the following tokens:—half a gold crown, a purse of red ribbon, a linen collar, a dark ribbon purse for master Norton, and beads for his wife. I am glad to hear you and the whole family are well. As to your monition that I should write more frequently to you. this letter may stand for a specimen or my studies. (fn. 1) Tistonia, (fn. 2) 11 March. Lat., p. 1. Add: My lady mother. 315. Will. Bremelcum to Lady Lisle. This is the English of my master's (fn. 3) epistle only for your ladyship. [Here follows a translation of the preceding letter.] Tystyd, 12 March. Hol., p 1. add: My Lady Lisle. “The confession of Michael Jamys made to me, John Cooke, commissary of the Admiralty in the county of Southampton,” 11 March 25 Hen. VIII. That Hugh Holland of Warblington and divers others (named), one of them dwelling with master Geoffrey Poole, went to sea on Tuesday se'nnight before Shrovetide twelvemonth, and pilfered a ship of St. John de Luce lying at anchor at Calshot, and put the crew under hatches; who afterwards surprised them and took them into Brest. Gives a further account of similar proceedings. R. O. St. P. vii. 545. Wrote last on 24 Feb. Five days ago Mons. de Likkerk, the Emperor's ambassador in France, came here on private business. The duchess of Milan, with Mons. de Prate, departed yesterday for Milan with 130 horse. Likkerke dined on Tuesday with Hacket, who supped with him last night. Having heard a day or two before that he had written to the Queen that the Pope, “whom I name the Unclement Bishop.” endeavors to draw the French king's amiry from the king of England, and is likely to succeed, asked him what they said in France, how the Pope was pleased with the king of England. He replied that the Pope was said to be eager to revenge himself on the English, and said further that he thought two things most necessary, unanimity between Christian princes and a general council for reformation of the Church, and said that the duty of himself and Hacket was to try to keep peace and friendship, while doing their Master's will. Letters from Ostriche of 14 Feb. say that Capt. Gritti is gone to Don Fernando as the Turk's ambassador, and that Schiperius was going as Ferdinando's ambassador to the Turk. The Turk is said to be marching against the Sophy. Hears nothing of the diet at Hamburg. The queen Regent came on Monday from my lord of Brederode's house to the Court, and will return today. The people of Maestricht are undecided with the Emperor, acknowledging him for their temporal lord and the cardinal of Liege for their spiritual lord. He has more good willers there than the Emperor. Never saw the Low Countries with less obedience of justice. Divers places are infected with “this nyew seghttes of rebaptissement,” and principally the east parts of Holland and Owyrstycht. Certain outlaws in Brabant have been burning farms unless money is sent to them, and the Queen has ordered her officers to be diligent in taking such malefactors. One of the Court here said he had seen a letter from England mentioning that the common people murmured against many things which they see now-a-days, and if a commotion were begun the Scots would take one part or the other, which might set the whole realm in great danger. 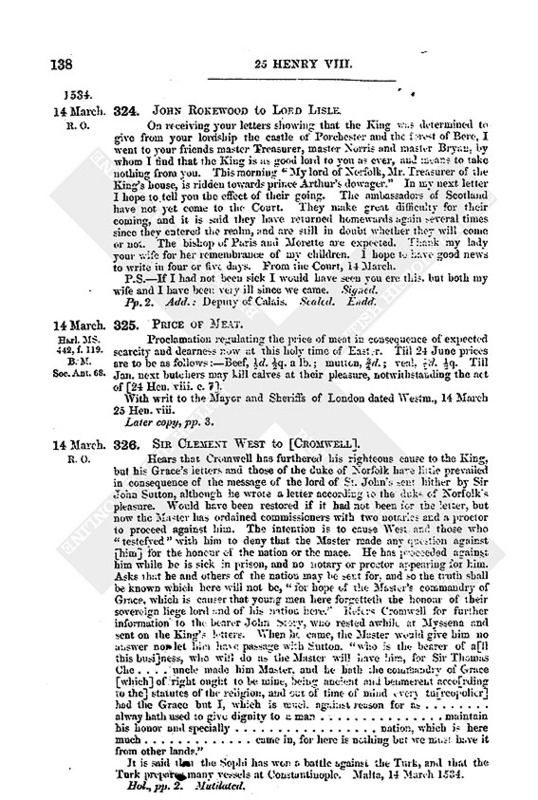 Said that the King's justice and amiable and good entreating towards his subjects would preserve his realm against all adversity, and he marvelled that those whose eyesight was so sharp as to see over the seas could not see the fire that burns before their own doors, and the commotion of this new sect of rebaptisement, which numbers 6,000 now, and is daily increasing. Brussels, 12 March. The Emperor's ambassador will shortly return to France. Hol., pp. 8. Add. : Master of the Jewelhouse. 318. Melanchthon to Fr. Myconius. Does not doubt that there will be a movement to restore the duke of Wirtemberg. 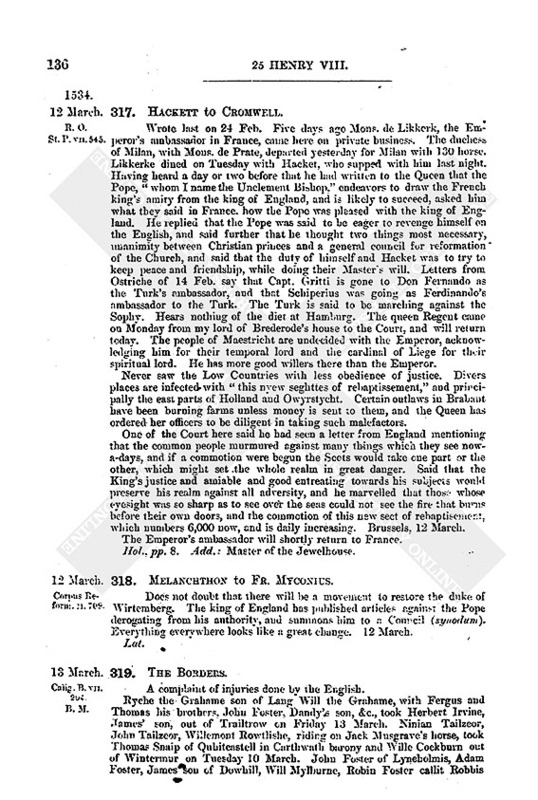 The king of England has published articles against the Pope derogating from his authority, and summons him to a Council (synodum). Everything everywhere looks like a great change. 12 March. Calig. B. vii. 204 B.M. 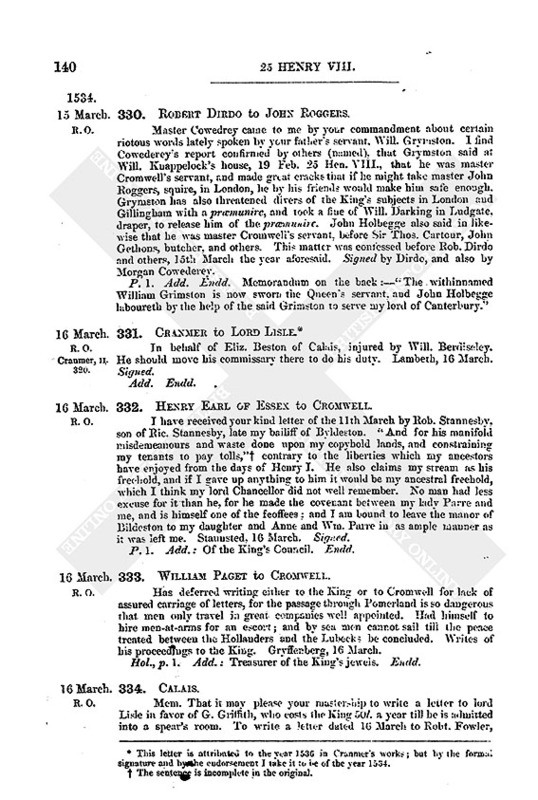 A complaint of injuries done by the English. Ryche the Grahame son of Lang Will the Grahame, with Fergus and Thomas his brothers, John Foster, Dandy's son, &c., took Herbert Irvine, James' son, out of Trailtrow on Friday 13 March. Ninian Tailzeor, John Tailzeor, Willemont Rowtlishe, riding on Jack Musgrave's horse, took Thomas Snaip of Quhitcastell in Carthwath barony and Wille Cockburn out of Wintermur on Tuesday 10 March. John Foster of Lyneholmis, Adam Foster, James son of Dowhill, Will Mylburne, Robin Foster callit Robbis Robin of Dobsonclois (? ), Will the Grahame callit Auld Will, and Henry Scott, took Adam Porteus and James Porteus, brothers, out of Tallowater on Saturday, 7 March. Huchon the Grahame and Perceval the Grahame his son took from Adam Wessatt 20l. Scots as ransom. Will, the Grahame of Baly, John the Grahame his brother, &c., took Charles Gadare (?). Walter Hunter laird of Polmude, Adam Porteus young laird of Halleschaw, Thom Welsche, Mich. Schankelands, at Glen Darg on Wednesday before Michaelmas. Begs him to continue his goodness to Tho. 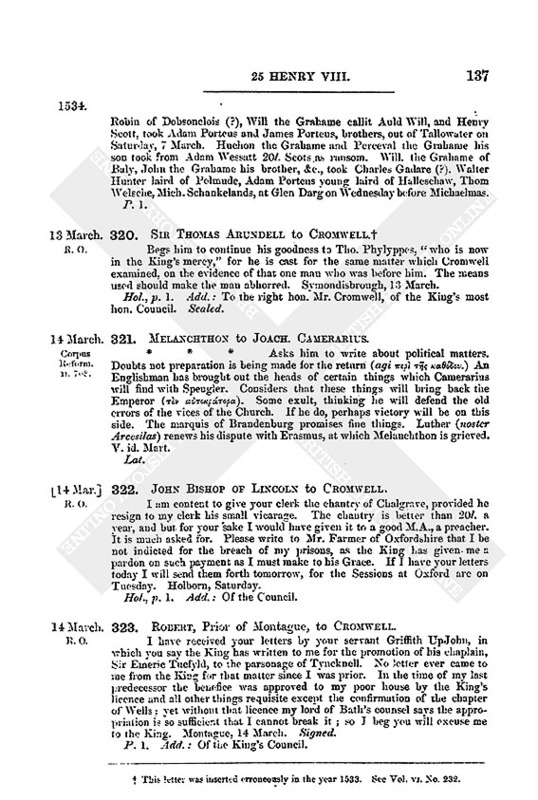 Phylyppes, “who is now in the King's mercy,” for he is cast for the same matter which Cromwell examined, on the evidence of that one man who was before him. The means used should make the man abhorred. Symondisbrough, 13 March. Hol., p. 1. Add. : To the right hon. Mr. Cromwell, of the King's most hon. Council. Sealed. 321. Melanchthon to Joach. Camerarius. * * * Asks him to write about political matters. Doubts not preparation is being made for the return (agi περι της καθοδου.) An Englishman has brought out the heads of certain things which Camerarius will find with Speugler. Considers that these things will bring back the Emperor (τον αυτοκρατορα). Some exult, thinking he will defend the old errors of the vices of the Church. If he do, perhaps victory will be on this side. The marquis of Brandenburg promises fine things. Luther (noster Arcesilas) renews his dispute with Erasmus, at which Melanchthon is grieved. V. id. Mart. 322. John Bishop of Lincoln to Cromwell. I am content to give your clerk the chantry of Chalgrave, provided he resign to my clerk his small vicarage. The chantry is better than 20l. a year, and but for your sake I would have given it to a good M.A., a preacher. It is much asked for. Please write to Mr. Farmer of Oxfordshire that I be not indicted for the breach of my prisons, as the King Las given me a pardon on such payment as I must make to his Grace. If I have your letters today I will send them forth tomorrow, for the Sessions at Oxford are on Tuesday. Holborn, Saturday. 323. Robert, Prior of Montague, to Cromwell. I have received your letters by your servant Griffith UpJohn, in which you say the King has written to me for the promotion of his chaplain, Sir Emeric Tucfyld, to the parsonage of Tyncknell. No letter ever came to me from the King for that matter since I was prior. 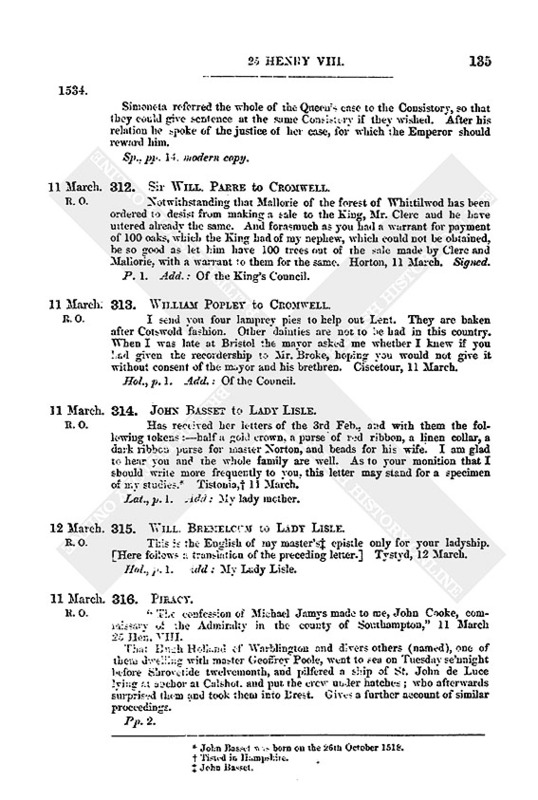 In the time of my last predecessor the benefice was approved to my poor house by the King's licence and all other things requisite except the confirmation of the chapter of Wells; yet without that licence my lord of Bath's counsel says the appropriation is so sufficient that I cannot break it; so I beg you will excuse me to the King. Montague. 14 March. Signed. 324. John Rokewood to Lord Lisle. On receiving your letters showing that the King was determined to give from your lordship the castle of Porchester and the forest of Bore, I went to your friends master Treasurer, master Norris and master Bryan. by whom I find that the King is as good lord to you as ever, and means to take nothing from you. This morning “My lord of Norfolk, Mr. Treasurer of the King's house, is ridden towards prince Arthur's dowager.” In my next letter I hope to tell yon the effect of their going. The ambassadors of Scotland have not yet come to the Court. They make great difficulty for their coming, and it is said they have returned homewards again several times since they entered the realm, and are still in doubt whether they will come or not. The bishop of Paris and Moratte are expected. Thank my lady your wife for her remembrance of my children. 1 hope to have good news to write in four or five days. From the Court, 14 March. P.S.—If I had not been sick I would have seen you ere this, but both my wife and I have been very ill since we came. Signed. Pp. 2. Add. : Deputy of Calais. Scaled. Endd. Harl. MS. 442. f. 119. B.M. Soc. Ant. 68. Proclamation regulating the price of meat in consequence of expected scarcity and dearness row at this holy time of Easter. Till 24 June prices are to be as follows—Beef, ½ d. ½ q. a lb. ; mutton. ¾ d.; veal. ½ d. ½ q. Till Jan. next butchers may kill calves at their pleasure, notwithstanding the act of [24 Hen. viii. c. 7]. With writ to the Mayer and Sheriffs of London dated Westm., 14 March 25 Hen. viii. 326. Sir Clement West to [Cromwell]. It is said that the Sophi has won a battle against the Turk, and that the Turk prepared many vessels at Constantinople. Malta, 14 March 1534. 327. Charles V. to his Ambassador in France. Has received by the sieur de la Chaulx his letters of 20 Feb., and thanks him for his information about the assembly at Bar and what the French king has said to him touching that and touching England, where things are going from bad to worse. * * * Toledo, 14 March 1533. 328. James V. to Clement VII. Royal MS. 18 B. vi. 31, B.M. 329. 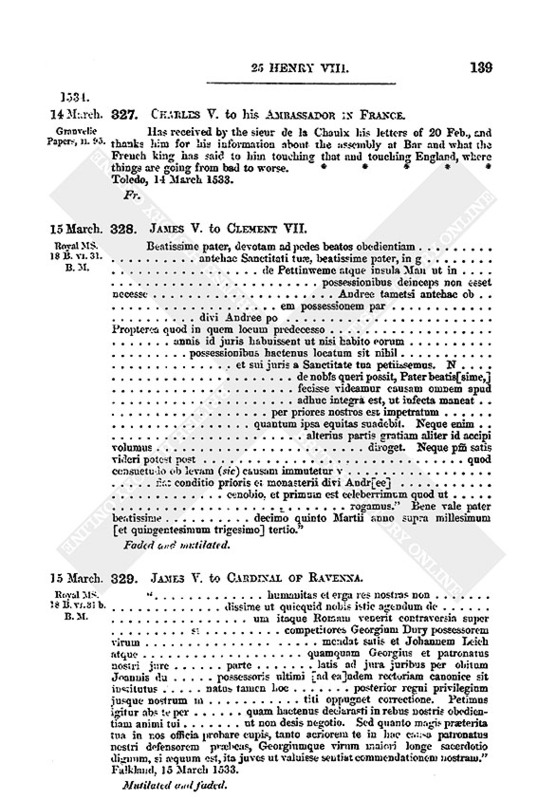 James V. to Cardinal of Ravenna. Royal MS. 18 B. vi. 31b. B.M. “... humanitas et erga res nostras non .. dissime ut quicquid nobis istic agendum de ... um itaque Roman venerit contraversia super ...st ... competitores Georgium Dury possessorem virum ... mendat satis et Johannem Leich atque ... quamquam Georgius et patronatus nosiri jure ... parte ... latis ad jura juribus per obitum Joannis du ... possessoris ultimi [ad ea]ndem rectoriam canonice sit institutus ... natus tamen Loc ... posterior regni privilegium jusque nostrum in ... titi oppugnet correctione. Petimus igitur abs te per ... quam hactenus declarasti in rebus nostris obedien tiam animi tui ... ut non desis negotio. Sed quanto magis praeterita tua in nos officia probare cupis, tanto acriorem te in hae causa patronatus nostri defensorem praebeas, Georgiumque virum majori longe sacerdotio dignum, si aequum est, ita juves ut valaisse sentiat commendationem nostram.” Falkland. 15 March 1533. 330. Robert Dirdo to John Roggers. Master Cowedrey came to me by your commandment about certain riotous words lately spoken by your father's servant, Will. Grymston. I find Cowederey's report confirmed by others (named). that Grymston said at Will. Knappelock's house, 19 Feb. 25 Hen. VIII., that he was master Cromwell's servant, and made great crocks that if he might take master John Roggers, squire, in London, he by his friends would make him safe enough. Grymston has also threatened divers of the King's subjects in London and Gillingham with a præmunire, and took a fine of Will. Darking in Ludgate. draper, to release him of the præmunire. John Holbegge also said in likewise that he was master Cromwell's servant, before Sir Thos. Cartour, John Gethons, butcher, and others. This matter was confessed before Rob. Dirdo and others, 15th March the year aforesaid. Signed by Dirdo, and also by Morgan Cowederey. 1. John Basset was born on the 26th October 1518. 4. This letter was inserted erroneoasly in the year 1533. See Vol. vi. No. 232.